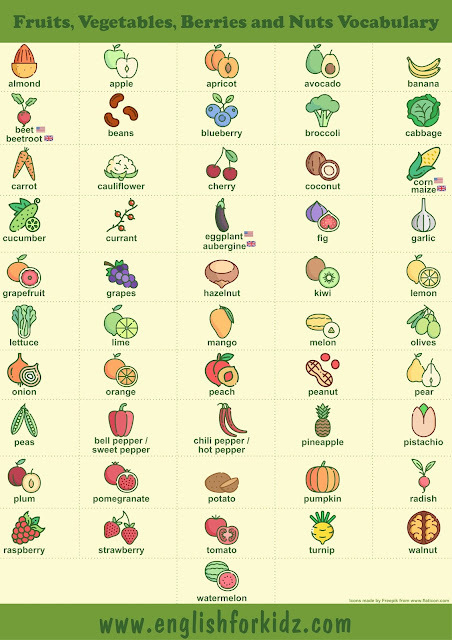 Spring has come to many parts of the world and the people there will soon be enjoying fresh fruits and vegetables. 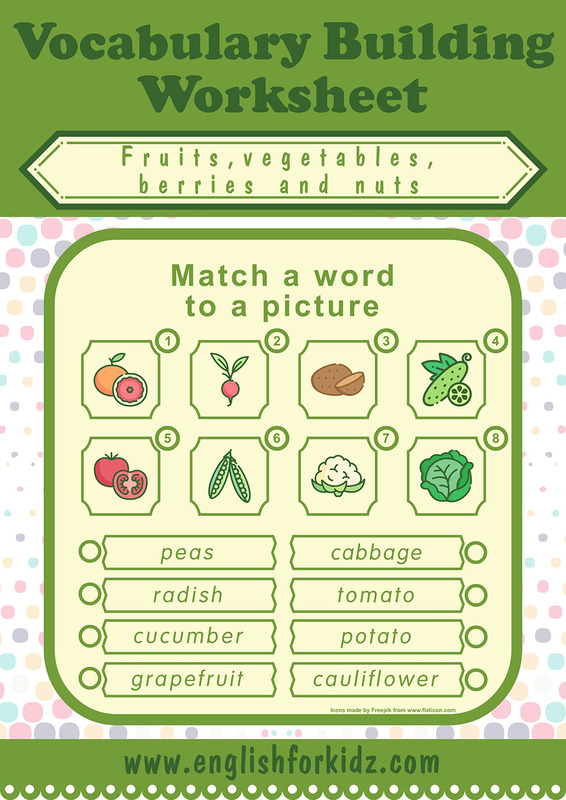 Living in a country where spring comes in March, I use this season of the nature revival to introduce the fruits and vegetables vocabulary to the students I teach English to. And as usual, for this purposes I have designed an entire collection of printable teaching materials such as worksheets, flashcards, domino and bingo games. 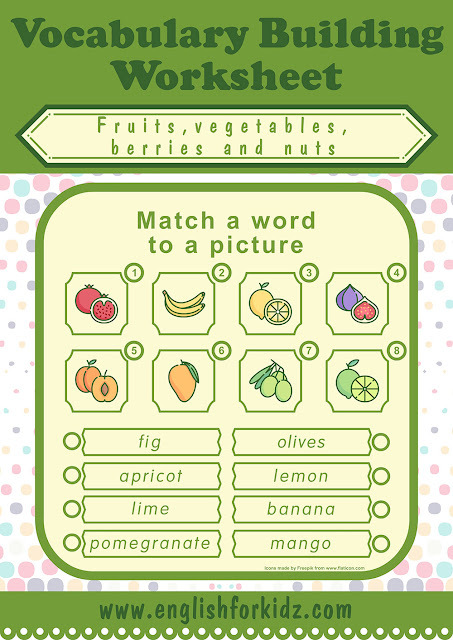 Designed in green colors, my vivid worksheets are supposed to help kids learn English names of some fruits, vegetables, berries and nuts as well as create the spring mood in the classroom. 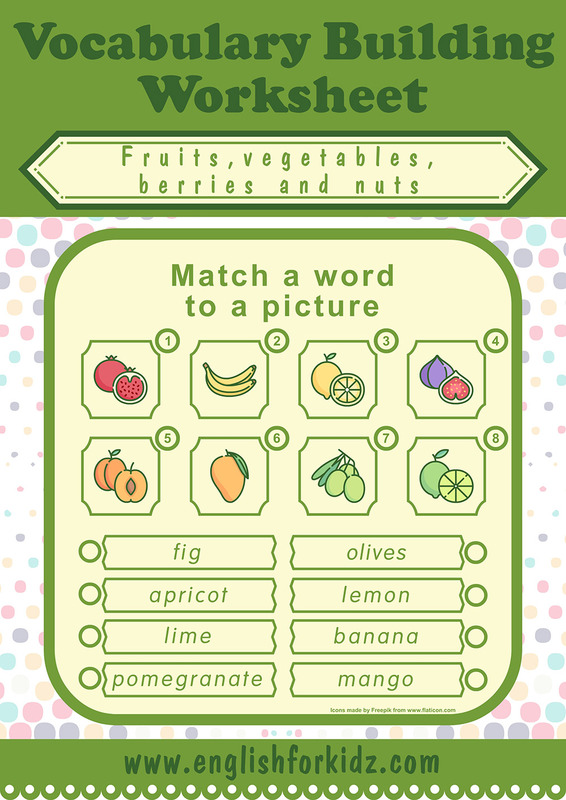 I have created the entire kit of printable handouts that ESL and EFL teachers can use to help their students memorize and consolidate the fruits & vegetables vocabulary. The kit consists of 8 word to picture matching worksheets (incl. one for British English vocabulary), 9 picture to word matching worksheets (incl. one for British English vocabulary), 6 word search puzzles (incl. one for British English vocabulary), 6 crossword puzzles (incl. 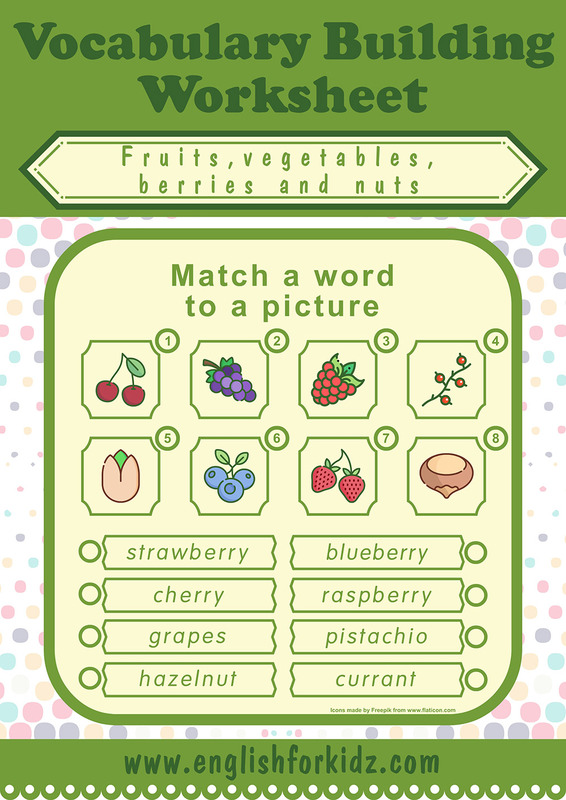 one for British English vocabulary), 54 colorful flashcards (incl. some British English variations), 51 domino cards (incl. some British English variations), 15 bingo cards with cut-out chips and word cards. My printables help introduce fruits & vegetables vocabulary consisting of around 50 words. 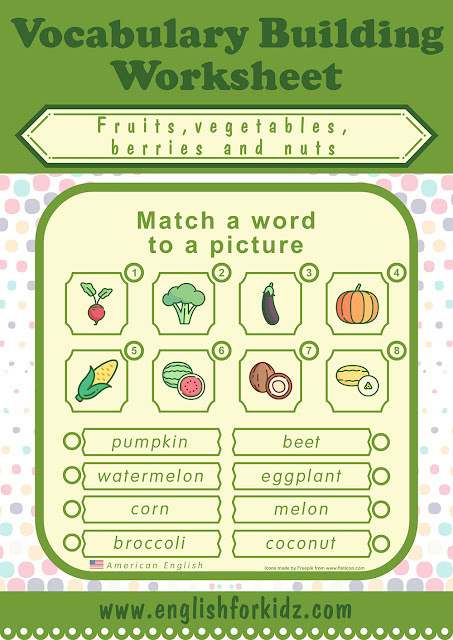 The fruits & vegetables vocabulary building kit can serve as a great tool to introduce more than 50 nouns for the topic. The featured vocabulary includes the following words: almond, apple, apricot, avocado, banana, beans, beet (UK: beetroot), blueberry, broccoli, cabbage, carrot, cauliflower , cherry, coconut, corn (UK: maize), cucumber, currant, eggplant (UK: aubergine), fig, garlic, grapefruit, grapes, hazelnut, kiwi, lemon, lettuce, lime, mango, melon, olives, onion, orange, peach, peanut, pear, peas, bell pepper, chili pepper, pineapple, pistachio, plum, pomegranate, potato, pumpkin, radish, raspberry, strawberry, tomato, turnip, walnut, watermelon. Fellow teachers are welcome to purchase the extended high resolution printer-ready PDF version of the kit in my store or use some of the materials that I upload to this blog. The premium version also includes worksheets, flashcards anв games that feature British English variations of some words. 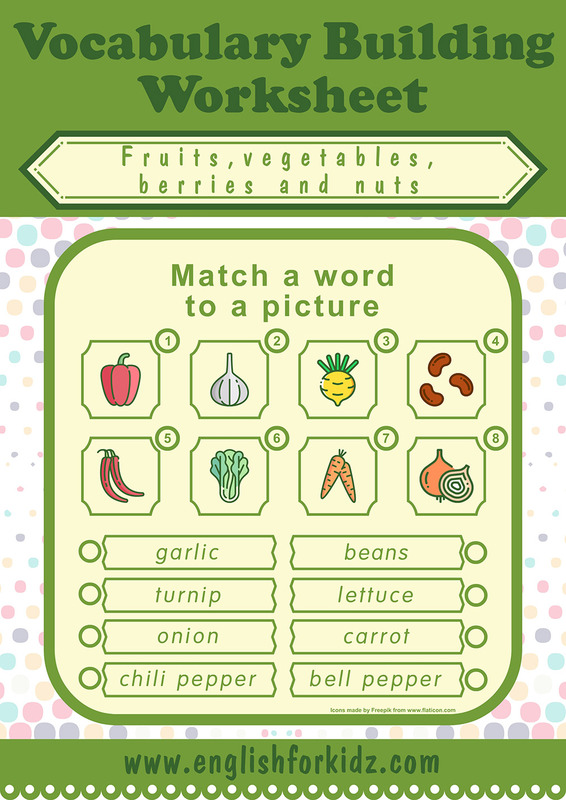 With this blog post I’m starting sharing some of fruits and vegetables printable worksheets and games. 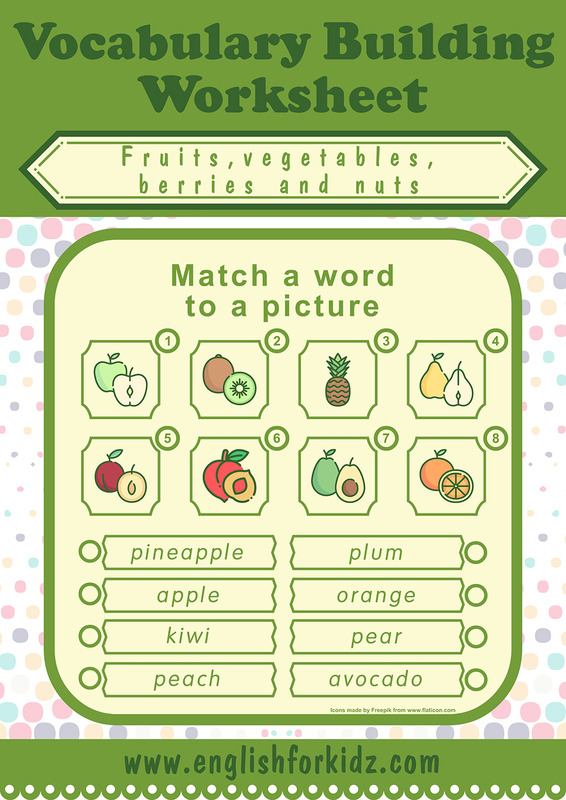 The word to picture matching worksheets are the first to become available for my fellow teachers vising this blog. 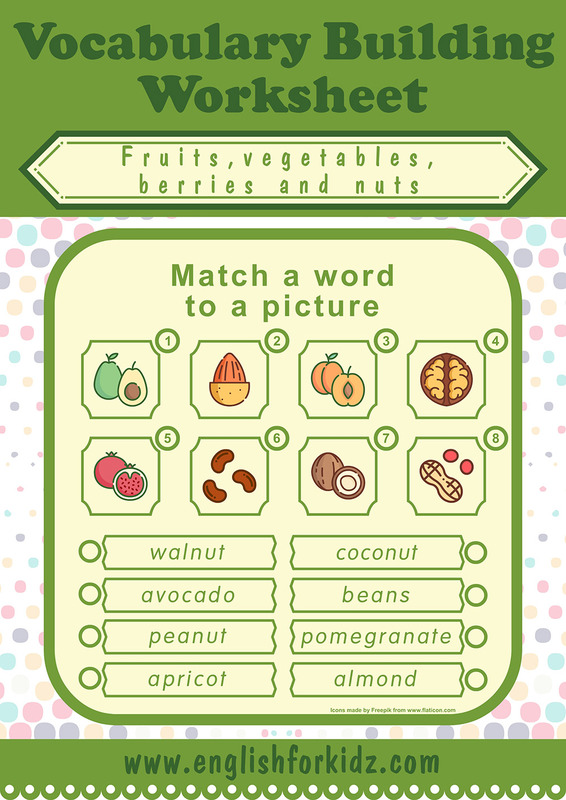 I hope they and their students will enjoy learning English vocabulary for fruits, vegetables, berries and nuts with my printable handouts.